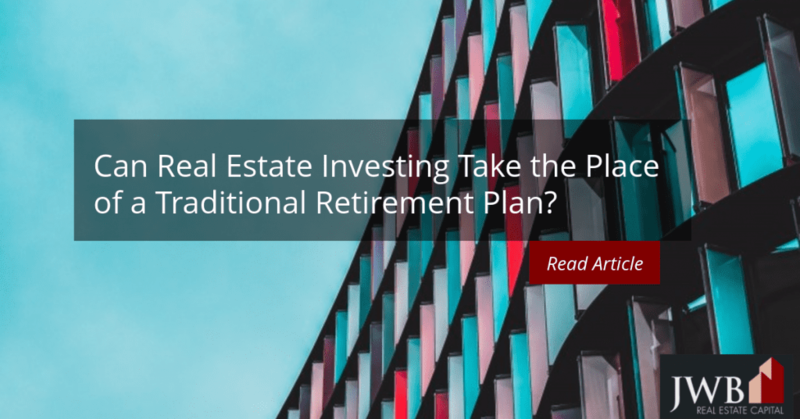 Can Real Estate Investing Take the Place of a Traditional Retirement Plan? Real estate investment is an attractive venture for retirees since it can be as active or passive as they like. Except under unusual circumstances, landlords receive a monthly check, and if held long enough, selling it can be quite profitable. But can real estate investing take the place of a traditional retirement plan like a 401K or an IRA? It could, but it would be risky to rely only on real estate investments. Diversifying your portfolio across several different types of assets is a more sound investing strategy. Diversity needs to form the foundation for your retirement income, particularly when you’re just starting to build your portfolio. Putting everything into a single asset class makes you vulnerable to market swings, especially if you plan to use it for monthly cash flow. See also Portfolio Diversification: Are You Making These Mistakes? Although it requires a significant down payment, real estate rentals provide a reasonably steady and stable cash flow every month. Such cash flow is particularly attractive for retirees who may feel the pinch when leaving their gainful employment behind. Besides cash flow, expenses associated with rental properties are tax deductible, and the property is depreciable for 27.5 years. Even more, rental properties can give property owners tax-exempt capital gains when sold if handled correctly. Although checks are in place to prevent the economic meltdown of the mid 2000s, they don’t preclude the downturns associated with the normal business cycles that occur in all industries. How they impact the rental real estate market depends on the sector in which they occur and how severe they are. Because housing is a necessity, rental housing is less vulnerable than the for-sale sector. Still, rental rates may not rise as quickly and it may take longer to find tenants for a vacant property. The presence of the Navy as the major employer, which adds stability and pumps millions and millions of dollars into the economy each year. The Jacksonville Port Authority that has a $27 billion impact on the Jacksonville area from cargo and cruises. The increase in year-after-year tourism in Jacksonville. In 2015, it was one of the five most visited cities in Florida, a state with more than its share of national and international tourist destinations. Because the Jacksonville economy has successfully achieved a high level of diversification, real estate investors experience lower risk of stubborn vacancies or falling property values. The economic underpinnings of Jacksonville’s economy are on solid ground, which bolster liquidity, but there are no guarantees regardless of the market’s conditions. It’s normally easier to sell other asset classes quickly. Even with a qualified buyer on hand, it takes time to complete real estate deals. Besides cash flow benefits and long-term appreciation, real estate investments pair well with retirement accounts. The rules allow borrowing from 401k and IRA savings to fund a down payment for a mortgage. If you opt for an early retirement, rental property will provide a monthly income before you’re vested in more traditional pension or retirement plans. Managed well over the years, the property will help you build your retirement savings or reinvest in more cash-producing properties. Either way, combining rental properties with more traditional investments will help you fund a secure and comfortable retirement.